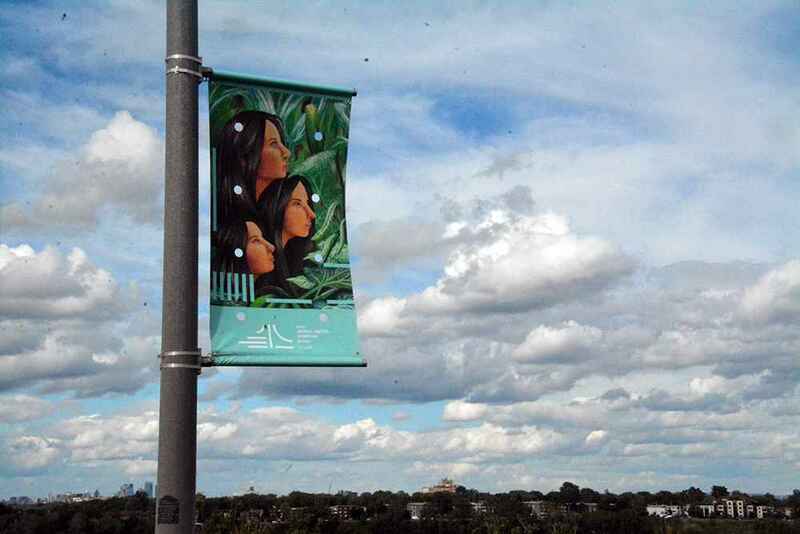 Within the week of the Jacques Cartier Champlain Bridges Incorporated (JCCBI) installing banners along the sides of the lanes going in and out of Kahnawake, a couple of them were targeted. “I don’t know how they accessed the structure, but it’s really unfortunate,” said Julie Paquet, communications spokesperson for JCCBI. JCCBI launched the project as part of the Canada 150 celebration, and worked in collaboration with the Mohawk Council of Kahnawake to promote local artists and beautify the bridge. 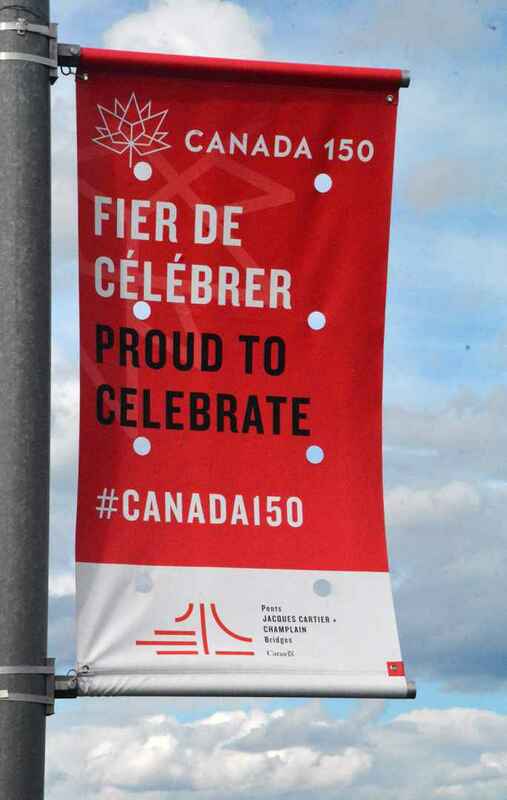 The banners feature five pieces of artwork from local artists as well as a red banners with “Fier de Celebrer/Proud to Celebrate #Canada150” written through the middle of the poster. The latter were the ones targeted. “We were really hoping it would be a nice community project to highlight the culture and celebrate, in a unique way, Canada 150,” said Paquet. None of the banners featuring artists Marian Snow, Skarahkotà:ne Deom or Tyra Ann Kaiente:ri McGregor were damaged. Paquet acknowledges that attitudes in Kahnawake are not the same as many Canadians when it comes to the Canada 150 celebrations, but hoped that motorists would appreciate what the company was trying to do with the project. “We realize that celebrations for the anniversary aren’t perhaps on everyone’s agenda for this year, and we respect that, but vandalized banners are not the best way to express that,” said Paquet. The company produced backup banners in case any were damaged due to weather, and the ones that were vandalized were replaced on the weekend. The red posters have been replaced by additional ones featuring the three women’s artwork. 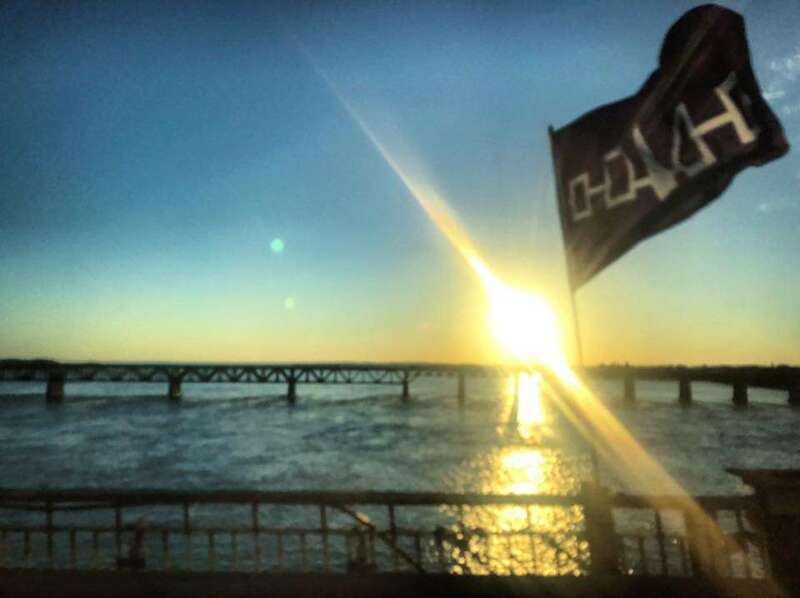 Comments in the Mercier Bridge / Kahnawake and Montreal Area Traffic Facebook page have been overwhelmingly positive, though David S. Lahache, who monitors the page, said there was chatter on Facebook about trekking onto the bridge and vandalizing some of the posters. “We’ve had tons of positive feedback from the community, so I think people really enjoy the art. That’s a good thing though,” said Paquet. Mohawk Bridge Consortium partner Amy Rice confirmed that the walkway along the southbound lanes is closed, and should only be occupied by work crews doing maintenance work. Safety and security personal from MBC monitor the span, and if motorists see someone on the bridge, they’re asked to contact the Kahnawake Peacekeepers or the SQ. For JCCBI’s part, the company wanted to highlight Kahnawake’s contribution to the bridge’s construction and acknowledge that it indeed runs through Kahnawake territory. “Canada 150 is about celebrating the country and where we came from and for us it was really important to mark the culture and how First Nations contributed to the story of the country,” said Paquet.